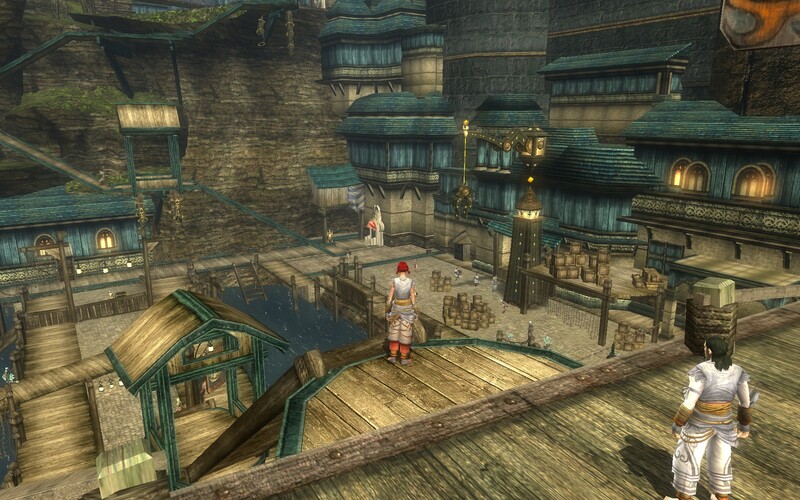 Reading about Syp picking up DDO again, at least for the month of August, made me reinstall the game and fiddle around. That plus I recently found an amazing guide for my favorite class, the Monk. So I skimmed over the Book of Syncletica, mostly to drool over the capabilities that higher level monks get, and then decided to roll up another one. Anyway, after finishing the short tutorial (again, but it’s good for me since I haven’t played in a while), I investigated the crypt in town. Yep, nothing like creepy stuff happening with monsters and odd noises from the crypt – hey do YOU want to investigate what’s going on?? Hehe. Later I was confronted with the new enhancements panel. Whoa that’s a lot of stuff. Good time to break and skim through Syncletica’s book! I entered a dungeon/sewer called “The Butcher’s Path”, where the goal was to kill 80 kobolds, survive to the NW exit, and slay Witch Doctor Kneeza. Not too complicated at all… the fun and challenge comes from the design where packs of kobolds (5+ at a time, often 8 or 10) attack. As a monk, I just kept clicking and using ki attacks when possible, and generally survived each fight slightly beat up. In this game, unless you drink a potion, find a rest shrine, use a skill, or get healed by another player (I suppose), your health doesn’t come back. So no standing there in between fights (like in Guild Wars) and topping of health! So after battling through a few waves, I was happy to avail myself of the first rest shrine I found… and later, another one. I also drank a few health potions, so I need to visit the store and look into buying more. 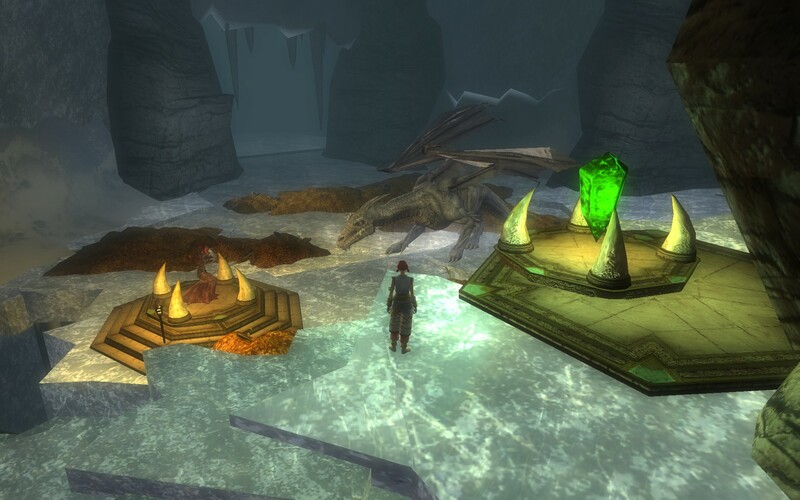 I’m not sure where to buy more health potions, but I’ll guess they are for sale in the DDO Store (the cash shop, not the in-game merchant you can sell/buy/repair at) since this is a F2P title. I used the tunnels and corners as much as I could, trying to get the monsters to attack me one at a time. The kobold shamans were problematic, as they cast spells – such as fear, which stopped me from attacking for a few seconds! I quickly learned to target the shamans first, then deal with the rest. Anyway, I emerged with enough experience points to reach 3rd level, so I went to the monk trainer and selected new class feats (Toughness, Path of Harmonious Balance) and enhancements. Now I can use Void Strike as an attack, which opens up a few more finishing moves. It looks like I don’t get any new feats until level 6, but at least I should be able to select more enhancements along the way. Unfortunately I have no screenshots of my play this evening – I hit Print Screen a few times, thinking I was getting a few. To my dismay I was using the wrong key – F12 takes screenshots. Argh! Well I won’t forget that and won’t make that mistake again. 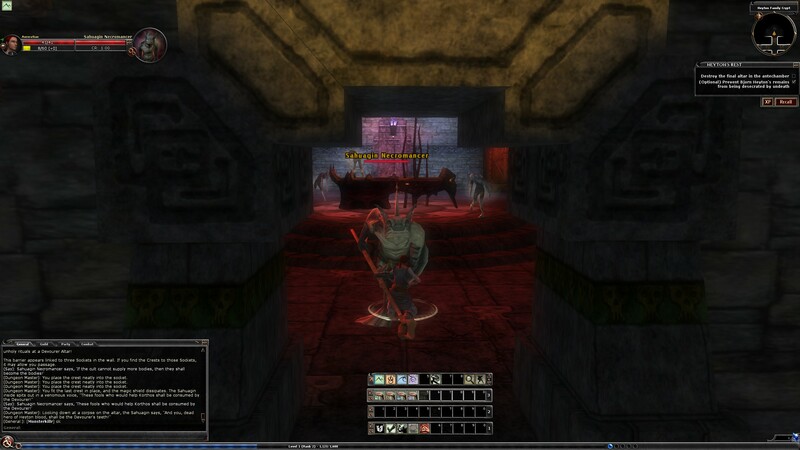 After reading a few posts by Skron over at The Frugal Gamer, my interest in DDO was rekindled. To find that it was available via Steam was an extra bonus! I deleted it a few weeks ago, to free up a little space on my computer, but had recently cleared up even more space, so I reinstalled it. And Steam makes that really easy. About 90 minutes later, I had a fully patched up game. Since it had been a few months since I played, and I wasn’t sure I made good choices with my character, I decided to start anew. The furthest I got was level 3, so it wasn’t like I lost much. 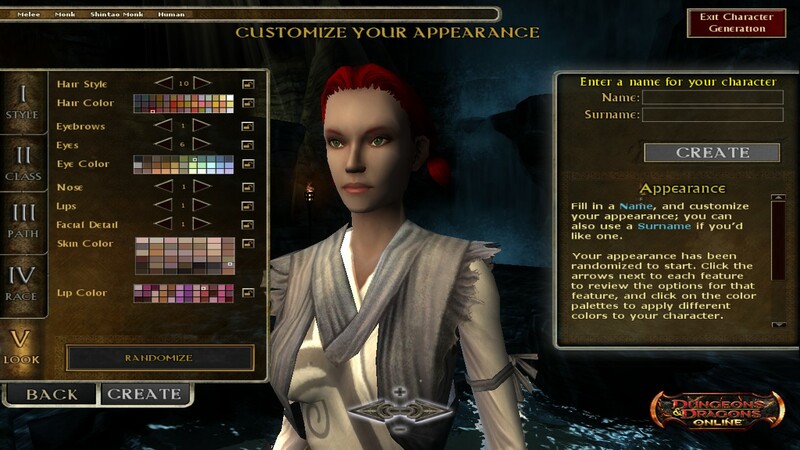 DDO has my favorite character creator. It yields lots of of different looks, and has everything right there on one page: make a change, see the result, with no excessive back and forth to select one section to customize versus another. I also think that showing the selection number between the arrows is great – no more trying to remember if I’d seen that graphic before, I can remember or jot down that I liked hairstyle #15 or whatever. As far as class to play… I really like the concept of the monk: the unarmed robe-wearing fighter, influenced by Asian martial arts. Their different class mechanics, bonus abilities, and combat capabilities – combinations and finishing moves – make the class irresistible to me. 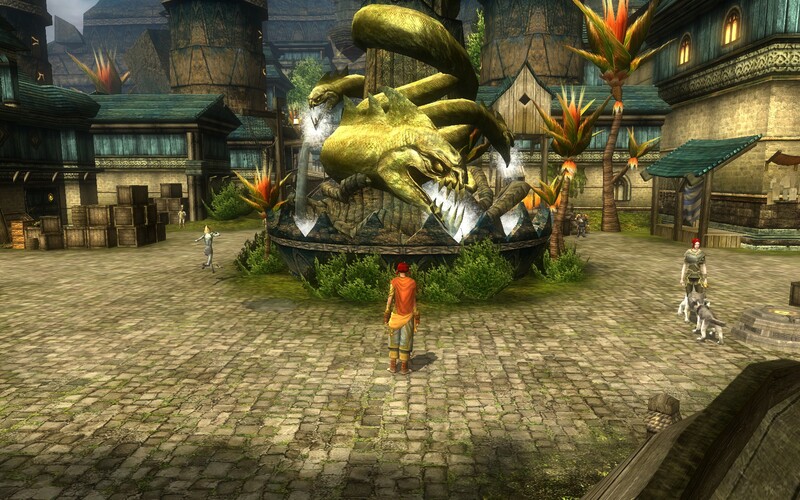 I dug around the DDO wiki and found a great article on building a monk, so I followed it. This was another reason I wasn’t too reluctant to restart; I don’t think I picked “good” traits and so on the last time around. 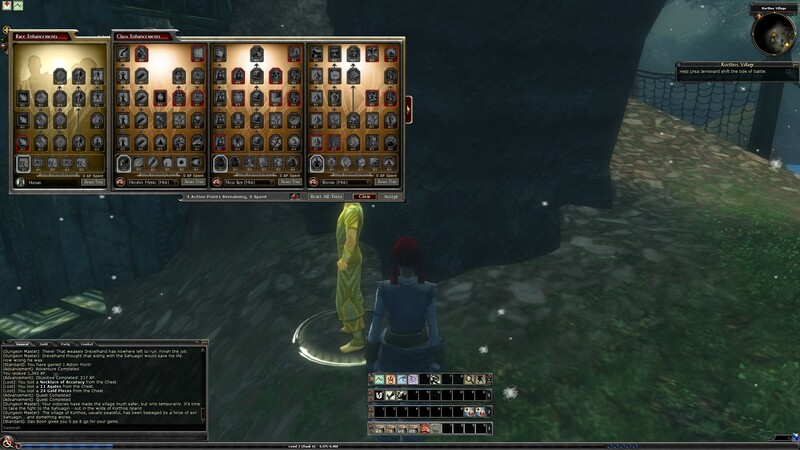 I can follow this guide and perhaps later when I’m not so lost I can try more customizations. Unfortunately I didn’t have much time to play, after the install and patch. I did make it through the tutorial, and had some fun destroying barrels. I do want to actually get somewhere in the game, so the challenge for me will be to play consistently enough to progress. I’ll be plenty busy trying to play this character to full potential while only playing occasionally. On the other hand I’m not in a real hurry… and I can decide about buying the expansion later when I advance along to a reasonable point.